Earlier this year, Singlefile released its tenth vintage of Chardonnay. 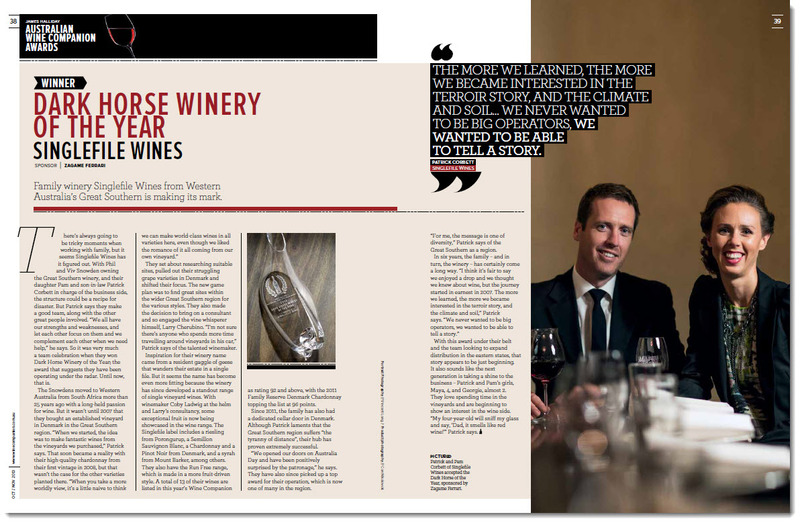 It’s been an extremely rewarding decade for the team, with the company’s signature variety winning many accolades, along with the devotion of wine club members. In this blog post, Viv Snowden recaps on Singlefile’s origins and the key events that got the winery to this milestone. Singlefile was effectively conceived in 2007, when Phil and I purchased an established vineyard in Denmark. Taking possession of the property in June, we spent our first two months cane pruning and tidying up three acres of Chardonnay with the advice of Ted Holland, a local viticulture consultant. He taught us the anatomy of the vine and the fundamentals of cane pruning, then let us get on with it. He’d come back once a week to check on our progress, giving gentle advice on how we could improve and offering great encouragement. We were privileged to have met Ted, who passed away in Albany a few years later. Our family and friends were also intimately involved in those early days. They’d come to visit armed with pruning shears, loppers, rakes and saws to tackle the daunting task of weeding the vineyard, removing some of the suckers – the shoots that grow from the base of young grape vines – and preparing the vines for re-training. Further help was provided by a mob of sheep we acquired to weed the vineyard that first winter. They made excellent progress, even helping to reduce the blackberry problem. During this time, we noticed the resident geese would walk in a stately manner in single file down to the dam every evening. We always stopped what we were doing to observe this routine, and we still do to this day. Most days were punctuated throughout with beautiful rainbows so we called our new home ‘Rainbow Cottage’. We settled on the name ‘Singlefile Wines’ in honour of the geese. Our first variety to pick in vintage 2008 was a Chardonnay. It was harvested by machine with Phil and I observing from the top of the harvester, then taken to the winery in the early hours of the morning. I have a photo of our silhouettes as we observed the delivery of our first grapes to the winery. We waited until it was de-stemmed and chilled, then toasted each other with an ice-cold wine glass filled with the most amazing fresh free run grape juice, before crushing took place…a memorable event indeed. Our son-in-law Patrick Corbett joined Singlefile soon after vintage. With a background in the finance industry, he brought energy, contacts, business skills and enthusiasm to the job of managing the business. Patrick became CEO of Singlefile in 2009 and since then has played a vital role in elevating our company’s recognition among critics and aficionados. Patrick oversees the selection of premium fruit and winemaking for all Singlefile’s wines. Patrick’s wife, our daughter Pam, administers the day-to-day business of Singlefile. In 2010, we won our first gold medal for the 2009 Family Reserve Chardonnay at the Blackwood Valley and WA Boutique wine show. This was the wine that made a name for us in the early vintages, but we soon became known for great quality wines across the board, initially expanding production to include Shiraz, Merlot, Semillon Sauvignon Blanc and Rose. The Chardonnay fruit for our first Blanc de Blancs sparkling was picked on February 28, 2010. Our winemaker assessed it as ‘perfect’ for sparkling, with a baume of 11 and total acid of 11. It remained on lees for six years, which required an enormous amount of patience, but paid dividends when we finally released it to our appreciative wine club members. Further recognition for our Family Reserve Chardonnay came in 2012, when James Halliday judged the 2011 vintage champion of the Great Southern region. He also named it in his overall ‘Chairman’s 11’ top Australian chardonnays for that year. Broader recognition came from Halliday in 2014, when he awarded Singlefile a 5-star rating and named us the Dark Horse Winery of the Year for consistent good quality across our entire range. We’ve won numerous other trophies and critical recognition since then, not just for Chardonnay but also our Pinot Noir, Cabernet Sauvignon and Riesling. What we have learnt in our 10 years so far is that good fruit relies on good locations and seasonal characteristics, plus good management practices. A successful winery needs a highly skilled team to deliver consistent quality.